December 1, 2017 - SafiSana is coming back to Handmade Arcade! We hope to see you there. SafiSana specializes in unique bags for the preschool set. 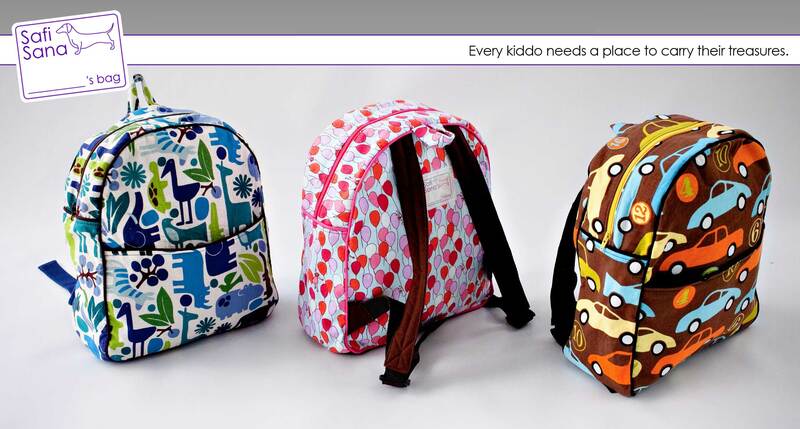 Our perfectly pint-sized backpacks feature whimsical prints and plenty of space for toys and snacks, while our zipper bags are ideal for a 3-year-old's special collection of rocks, shells, or plastic animals. Our water bottle holders fit large and small bottles alike. At our house, Safi is our dog - a miniature, red, short-haired dachshund. We think she’s pretty neat. And, in Swahili (the language spoken in much of East Africa), "safi" means just that – neat. Safi sana means very neat. 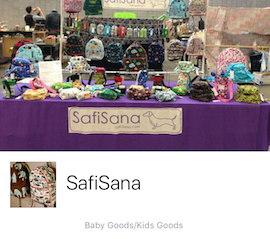 And because we think the backpacks and bags we make will help keep your little ones hip and organized, SafiSana seemed like the perfect name for our little company. The idea of making and selling bags came out of our attempt to find a backpack for our then two-year-old that both fit properly and was as unique as she. That first backpack has been on many airplane rides and car trips, has been washed again and again, and is filled to the brim with our favorite toys and books. And inside the backpack, her first treasure bag has been along for the ride – carrying our daughter’s favorite plastic animals everywhere. And I’m the one doing the sewing and the cutting and the ironing – the making. I’ve been having so much fun selecting the perfect fabrics and seeing how each backpack and treasure bag comes together. And I secretly believe that there are few things cuter than a preschooler wearing a backpack! Don’t know why, but I do. And he’s the one who has been putting together this lovely website and helping with logistics and keeping track of our two daughters and our dog (and the cat too) while I lock myself away to sew.